My family and I received a week of Spanish Classes for review purposes. The opinions in this post are completely my own and based on my experience. 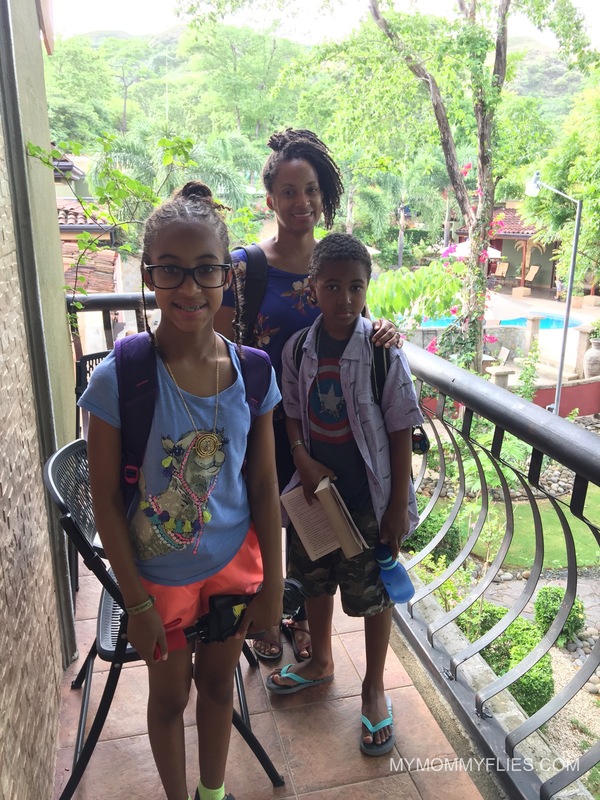 When I decided to homeschool my kids, learning Spanish in Costa Rica was high on my list. 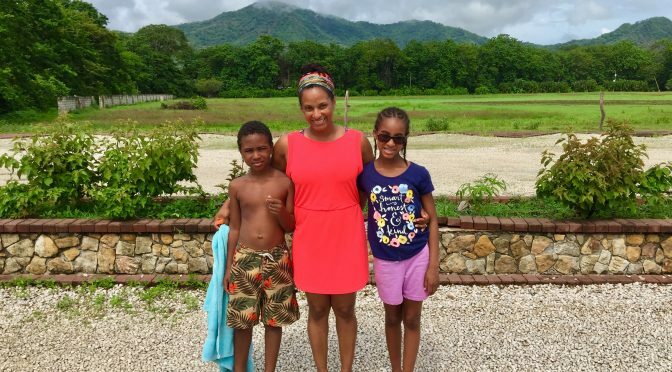 I knew that I wanted to provide a rich foreign language experience and after visiting Costa Rica, I decided it would be a perfect place for our family. 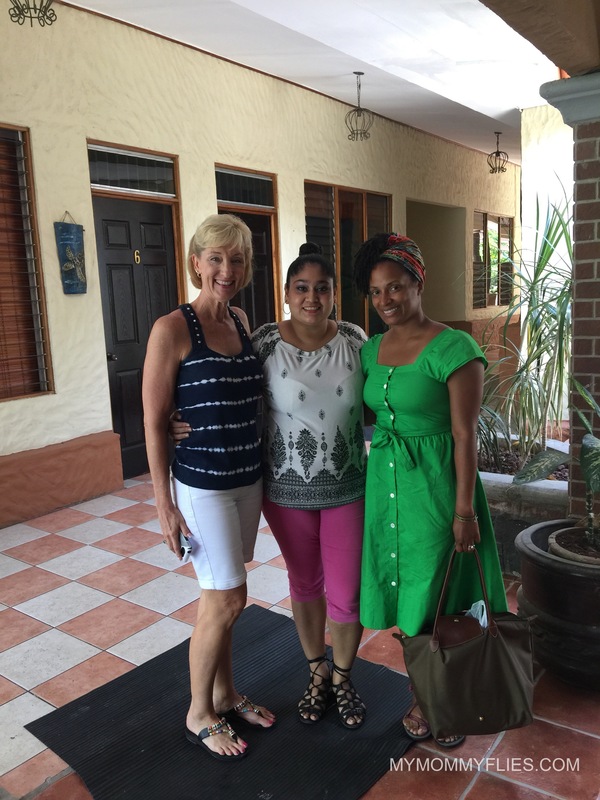 We recently returned from a two-week language immersion in Costa Rica. During our trip, there were news reports of thousands of children being separated from their mothers crossing the southern border into the United States. Like every mother, I was both concerned and devastated. I wondered what I can do to help these families. And not just the families being separated and detained, I was also thinking of the immigrant families back home. There are communities in Atlanta that are living in the shadows in fear of judgment, bias, or worse, ICE. Like every mother, I was both concerned and devastated. I wondered what I can do to help these families. That’s when it hit me! If I can l can learn to speak fluent Spanish, and if my children can learn to speak Spanish, then we can talk to our neighbors in their native language. We can break down walls of communication, open cultural barriers, and change the way we treat each other in our community. Learning Spanish was something we were already doing in Costa Rica, and the immigration crisis and the inhumane treatment of others gave us a greater purpose. Daily activities available at CPI Costa Rica. 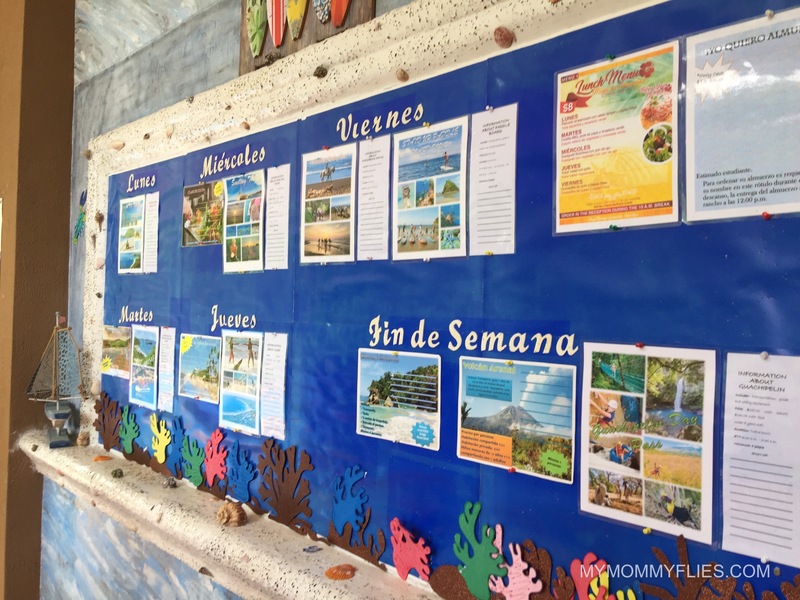 Spanish Immersion is a simple and enjoyable way to enrich your family’s travel experience. Learning a second language can boost your child’s IQ, increase memory retention, and cultivate linguistic abilities. Language is filled with history, people, and culture. Learning a foreign language instills compassion and an appreciation for diversity. Studies have shown that learning Spanish through immersion has a far greater impact than a traditional classroom setting or online tutorial. Heading to our first day of classes at CPI Costa Rica. Costa Rica is one of the best places in Central America to study Spanish partly due to the high value the government places on education. It is one of the safest and most developed in the region and still maintains its small country feel. Costa Ricans, or Ticos, speak clear Spanish with very little slang making it easier for students of the language to comprehend. The people are beautiful, the views are perfect, and there is so much to explore in Costa Rica. ‘Pura Vida’ (meaning Pure Life) is more than just a common greeting and response in Costa Rica, it is a way of life. 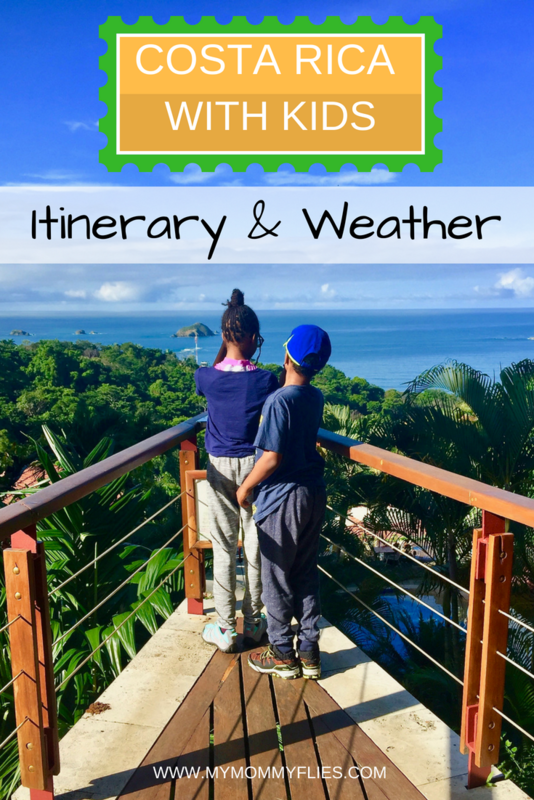 Itinerary of our Trip to Costa Rica! Why I chose CPI Costa Rica? Simply put, CPI is the best Spanish Immersion school in Costa Rica. They are accredited by the Costa Rican government and have over 30 years experience teaching students of all ages, levels, and backgrounds. CPI Costa Rica is also the only school in the country with three unique and convenient locations: Heredia, Monteverde, and Playa Flamingo. Unlike other language schools in Costa Rica, CPI has year-round classes and language instruction for children as young as four years old. Teachers are highly educated, trained professionals and not babysitters. Casas del Toro in Playa Flamingo was our home-away-from-home while studying Spanish in Costa Rica. Waiting for our bus to class at CPI. Our CPI experience was at the Playa Flamingo location. We selected the beach because we would be traveling through Costa Rica and going on adventures for a week before we would start classes. Our time at Playa Flamingo would be spent learning Spanish and taking some much-needed downtime at the beach. Tuition cost currently for CPI is $460 pp a week. There are discounts available for families taking classes or multi-week sessions. Textbook and workbooks are included with tuition. Also included is a daily snack, Spanish cooking or dance classes after school, and shuttle service to local destinations. 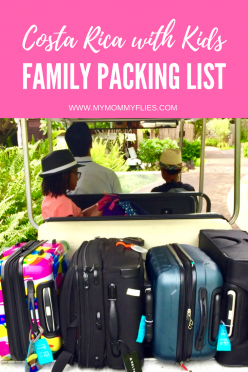 Packing List for Costa Rica with Kids here. We stayed in a one bedroom spacious apartment in Casas del Toro and really enjoyed our space. The kids spent a lot of time in the pool. We met other families taking classes and families just visiting the Playa Flamingo area. The grounds are beautifully maintained. There is a garden area with paved walkways and spewing water fountains. The setting is peaceful and tranquil. 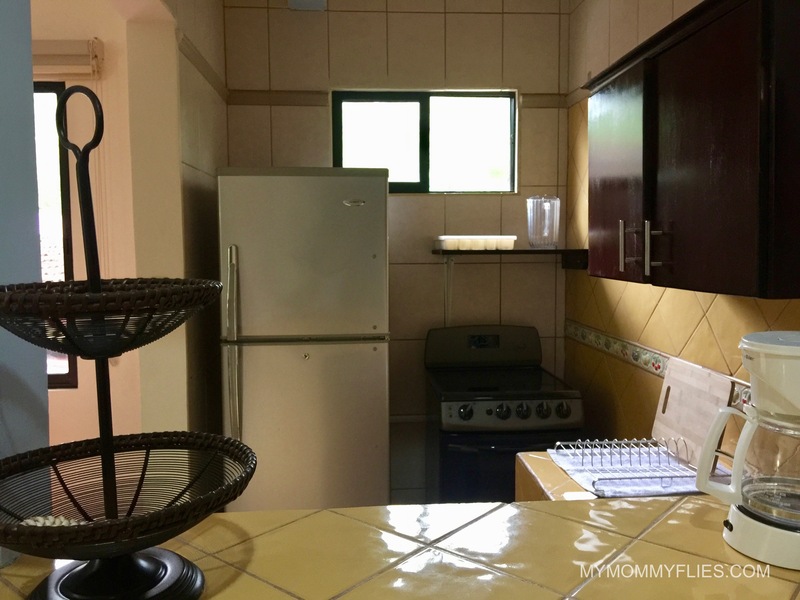 The kitchen in our one bedroom apartment in Casas del Toro. More photos on Facebook page here. Expect to pay around $500-$1000 for one week (7 nights) accommodations at Casas del Toro when you are signed up for classes at CPI. Breakfast is complimentary and so is the short shuttle service to CPI for class. There’s a supermarket nearby and we were able to stock up on snacks and food to prepare some of our meals. The staff at Casas del Toro was very attentive and the rooms were cleaned daily while we were in class. Casas del Toro was our home away from home in Costa Rica. Playa Flamingo is a small beach town that offers a good mix of Ticos (locals), visitors, and U.S. and Canadian expats. We had plenty of dining options to choose from. One of our favorite restaurants in Playa Flamingo is the Surf Box. We dined here twice during our stay. Coco Loco restaurant is at the end of Playa Flamingo and is a great place to unwind after Spanish class at CPI. The fish tacos here were memorable, to say the least. Though the school sits directly across from the beach, it’s not the side of the beach you’d want to relax or swim on because of the boats in the water. The relaxing area of Playa Flamingo is a short walk from the school. Playa Conchal and Tamarindo are also nearby and very popular. 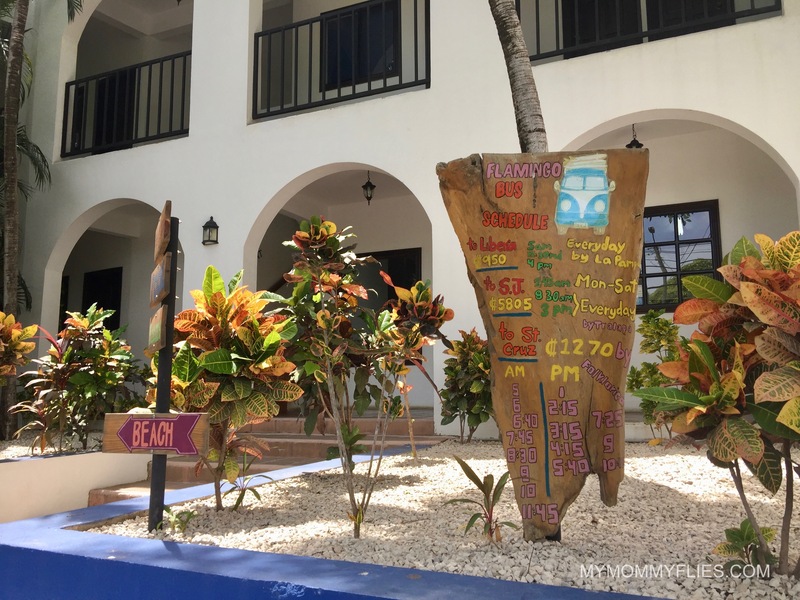 Playa Flamingo is a quaint beachside town with a good mix of local, travelers, and expats. 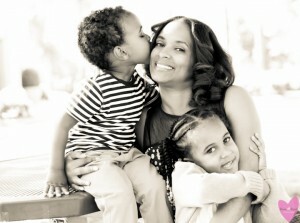 All families are welcomed at CPI and classes for children starts at age 4. You don’t need to have any experience in Spanish. My children, 9 and 11, have not had Spanish instruction in at least five years. They were both at beginners level before this experience. I took some Spanish in high school and college and had very little practice since. Mi maestra señora Goudy, mi compañera de clase y yo el último día de clase a CPI de Costa Rica. If I can l can learn to speak fluent Spanish, and if my children can learn to speak Spanish, then we can talk to our neighbors in their native language. Classes are small and average 2-3 students with a max of 4. I had one other student in my class. My children were in separate classes (thank goodness and I didn’t even have to make this request), and had two and three students in their classes. Classes are held Monday – Friday 8:00-12:00 with a 15-minute break at 10 am. It was just three of us in my class, including the instructor. The classes are taught almost entirely in Spanish, except on the occasion that the teacher needed to translate something. The kids enjoyed their class experience at CPI. 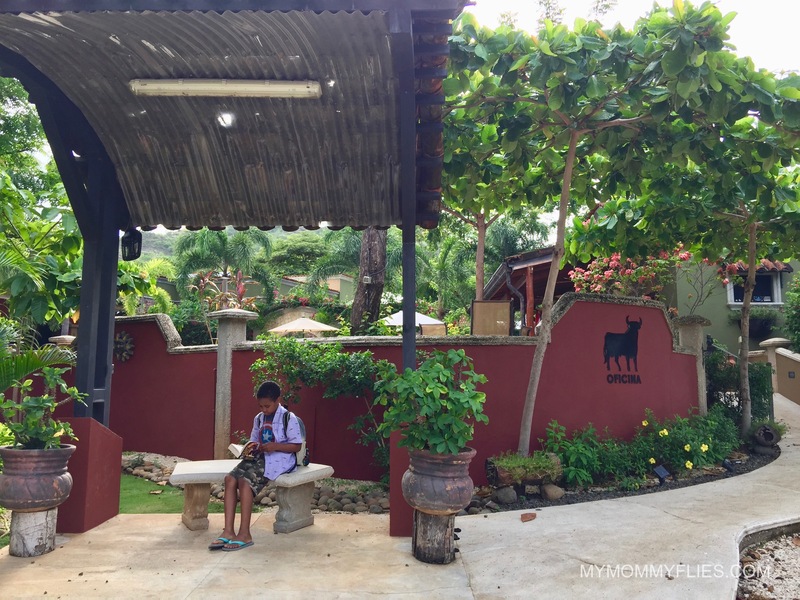 I was worried about my 9-year-old who didn’t think the idea of going to school in Costa Rica a great one. He’s very hard to please and prefers to do Minecraft or read his books. After the first day, my kids adjusted well and were running to class every morning. The basketball court and swimming pool were there favorite and made classes at CPI that much more enjoyable for them! 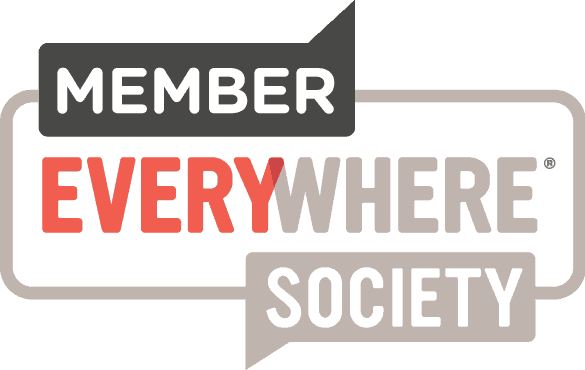 We can break down walls of communication, open cultural barriers, and change the way we treat each other in our community. Once we returned home to Atlanta, I arranged for us to continue Spanish lessons online with a tutor. We plan to take another trip to Costa Rica to study again at CPI, next year! Do you have more questions about our trip to Costa Rica? Leave me a comment below. Love your post! Where/how did you find the tutor online for the kids? I’m going to homeschool them this coming year and we will do some in Spanish -because they are already in immersion school- but I also want a tutor for them! Hi Iliah, CPI offers continue education online with live tutors. You can also do online classes before your immersion experience and of course after! Thanks for checking out my post!! Thanks so much for this info. What a wonderful opportunity for the whole family to study abroad. Currently my daughter is in Spanish Immersion school here in Atlanta. I’m always looking for ways to mix her language learning more real world and this looks like a great opportunity. Hi Gina! I’m so glad you liked the post and my review for CPI. 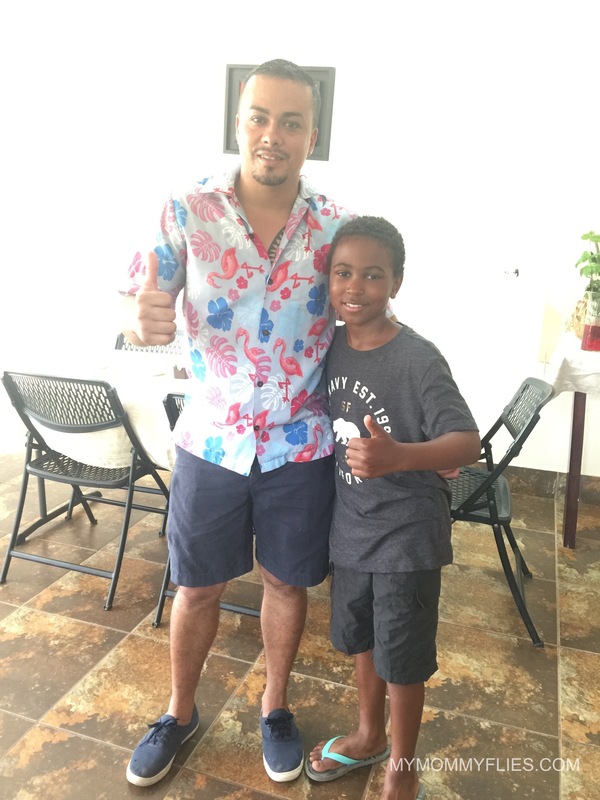 Your family would absolutely love the experience in Costa Rica studying Spanish. Let me know when youre ready to plan a trip. I’ll be happy to help you! Our kids just came back from a week of French lessons and they were also very reluctant to go in the beginning, but in the end they loved it. However, their knowledge after just a few lessons is of course very limited. We see it more as a way to introduce them to a new language in a playful way. But indeed I see a lot of advantages of learning a language when traveling to a country where that language is used. It’s so much easier to learn when you hear it all around you every day. This is something I never considered in the past, but will definitely think of it now that I read about your experience. Hi Jurga, thanks for checking out my post. Language immersion is a great way to introduce, practice, and master a foreign language no matter how old. I’m glad you’re considering giving your children this experience! Three locations and accredited by the government? This sounds amazing. I love how school is only in the am, so you can explore at night. We don’t homeschool, but this is something I’d totally do over spring break with my teen. Hi Jody, This is an amazing opportunity for families. Spring Break is a perfect time to visit. There’s also discounts for families. If you need help booking, feel free to contact me. Thanks for checking out the post. It’s so great that you did this! 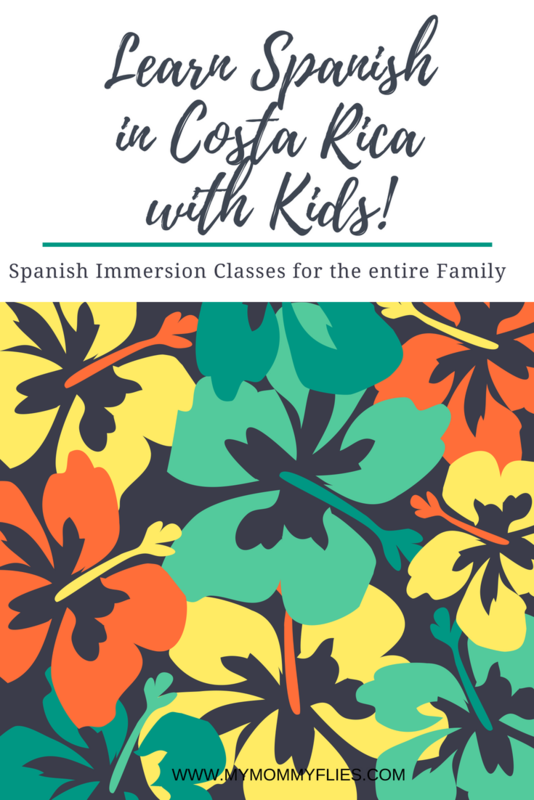 I did a Spanish immersion class in Mexico before I had kids, but would love to do one again with my family! This spot seems like a good one, too. You’re welcome Lillie! Thank you for checking it out. CPI does offer discounts for families. I can help you plan a trip if you’re interested! We spent a month in Mexico this past summer, where my kids attended Spanish language camp. We are looking for another country where they can continue their studies next summer so I was excited when I read your post! But, the cost is very, very high. We spent $250 per week in San Miguel de Allende, Mexico for classes 9 am – 1 pm, Mon – Fri. Do you know why they charge so much? Is pricing negotiable? Hi Colleen. There is a discount for families. Costa Rica, in general, has a higher exchange for US dollar. I still think its a great value for families that want to explore Costa Rica while learning Spanish. Thanks for check out the post!